Bella the chocolate Malchi (Chihuahua / Maltese mix breed puppy) at 12 weeks old—"She is the runt of a litter of 7 puppies. Her mother was a brown Chihuahua and father a Maltese." Darby the black Malchi (Chihuahua / Maltese mix breed) puppy at 2 months old—"His father is a Chihuahua and his mother is a Maltese. He chews on everything!" 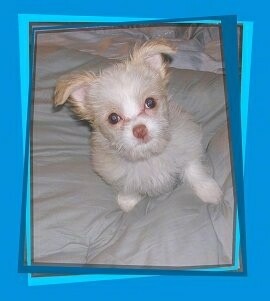 Kylie the white Maltese / longhaired Chihuahua mix breed dog (Malchi) at 10 months old has a pink nose and big green eyes! She has finally reached her adult weight, which is 5 pounds. Her owner says, "We absolutely love her more than anything in the world!!" 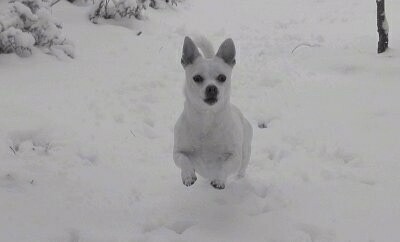 Regan the 1-year-old tan and white Malchi (Maltese / Chihuahua cross)—her owners say, "She is a little ball of energy."